First, choose a location, program, and class time(s). You can register for gymnastics classes online—simply set up an account and you will be ready to go. Click on the REGISTER NOW button. Download the schedule below by clicking on the location where the class is being held. 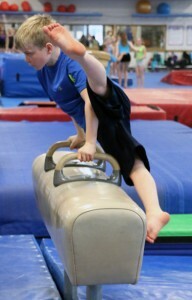 View the Complete Madtown Twisters Gymnastics Class Schedules below. You may also use a credit card to register via phone. A Participant Waiver is required before participation. In most cases, classes average 4 weeks per month. We close for vacations approximately 4 weeks during the year. To safeguard and retain your child’s space in class, continued enrollment is assumed. Written notice must be received by the 15th to withdraw at the month’s end, or you will be responsible for the following month’s tuition. Payments are automatically deducted from your checking account or credit card on the 2nd day of the month. Tuition Fees are non-refundable. We are not able to offer credits or refunds for missed classes. 2nd Child – 10%, 3rd Child – 20%, 4th Child – Free (discounts taken off lowest tuition amount). Madtown Twisters is unable to offer make-ups for missed classes. We do offer free open gyms with all monthly tuition, and would be happy to give you an open gym pass for missed class to bring a sibling or friend with you to one of our open gyms. Shorts and t-shirt or leotard should be worn for class. Warm ups are ok as needed. Socks are optional. Please, no jewelry. Leave Valuables at Home. This is occasionally a problem. We can assume no responsibility for lost or stolen items (cell phones, money, etc. ).